R2DLiu is a smasher from Delaware, United States who mains Fox. He is ranked 2nd on the Philadelphia Power Rankings and 2nd on the Delaware Power Rankings. 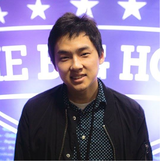 He became well known for getting an unexpected 33rd at The Big House 6 upsetting Axe in winners before losing a very close 2-1 set to KirbyKaze as well as a set to Ryan Ford. He also has wins over the likes of The Moon, Mafia, Lovage, and JFlex. This page was last edited on April 20, 2019, at 05:37.